Sunday morning, I woke up with an unreasonable craving for granola bars. It probably had a bit to do with the statement Mr. How Sweet made on New Year’s Day… something along the lines of wanting to buy Fiber One bars in bulk? I raised an eyebrow. He does not need any more fiber. Trust me. Why won’t he eat my own granola bars? I’m sure if I could create a granola bar out of chicken and steak, he’d go to town on that. But now that I’ve left you with that digusting image in your head , let me tell you about the deliciousness that is these peanut butter granola bars. They may just be the simplest bars you’ll ever make! You only need five ingredients to begin. They will create a simple, perfect peanut butter granola bar, but I also like to think of it as a base for a packed peanut butter granola bar. Since I’ve made six batches of these bars since Sunday, I can tell you what works: chocolate chips, dried cherries, almonds, wheat germ, dried figs, and dried banana. Yes, dried banana. A peanut butter, honey and banana granola bar! Mmmmm. I think I’m in heaven. Into this particular batch went a boatload of chocolate chips, because well… we all know nothing is better than chocolate and peanut butter. I know I don’t need to explain myself to you guys. You know me. And since you know me, many of you are probably wondering when I’ll cave and add bacon. Honestly, I just thought about it for the first time as I was writing this post. Perhaps I need to make an Elvis granola bar? I am giddy at the thought. I might need to be committed after that one. The best part? You don’t even have to bake these bad boys. I baked 3 batches and left 3 other batches as no-bakes. I can’t decide which I like better, but I do love that the chocolate gets a bit melty in the oven. Have you ever bit into a warm granola bar? You need to experience this. 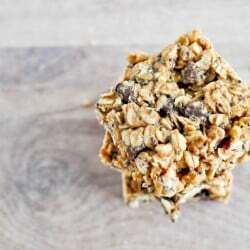 The funniest part of these granola bars is that before I perfected this easy concoction on Sunday afternoon, I had 3 failed attempts – all more complicated and full of fluff. Sometimes simple is better, no? At least I’m off to a good start with 2011 recipe disasters. Nothing like getting ahead. 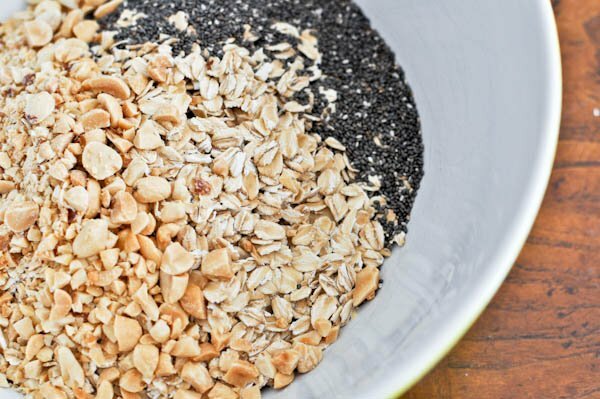 In a large bowl, combine oats, chia seeds and peanuts. Add brown rice syrup (or honey) and mix to combine. Add melted peanut butter and mix until moistened. This works as a perfect, simple granola bar, but you can also throw in any add-ins at this time. Fold them into the dough. You may need to get in there with your hands and work the granola dough! If dough is still too dry (this can depend on your ingredients) add more peanut butter or syrup (or honey) 1 tablespoon at a time until moistened. Press dough in a greased (non-stick spray) 9 x 13 baking dish. Bake for 25 minutes. These would also work as a great no-bake granola bar, but I liked how they came together and the chocolate chips melted as they got warm. If you want to make no-bakes, simply press the dough into the pan and refrigerate for 60 minutes. Off to dream of bacon granola bars. Don’t hate. This recipe looks awesome! Do you think you could add the nutritional value of one bar or the whole recipe? I’m on a diet so I’m counting the calories….. These are awesome! I just use the rolled oats, melted peanut butter, honey and chocolate chips and my mother goes bonkers over them! They’re very delicious and simple. I read a comment about them falling apart and mine do the same, but I didn’t think of using them as cereal, great idea. Thank you for the recipe! After reading some comments on how this recipe didn’t turn out as planned, I halved all of the ingredients, in case it didn’t. I used honey instead of brown rice syrup, since I had a lot on hand, and I used a natural (store-bought in a jar but made from real peanuts) peanut butter. After only about 15-20 minutes, it looked pretty browned, so I took it out early. Unfortunately, mine was also crumbly and didn’t stick together like bars at all. Maybe a stickier, sugarier peanut butter (e.g., JIF or Peter Pan) would work better. Even though it didn’t work out, I think it’ll still make a good granola to go in yogurt. I too baked them and they were dry, crumbly and tasteless. However they were delicious when I sampled them before putting them in the oven so next time I will just refrigerate them. I made some of these just now. I replaced the nuts with sunflower seeds, the brown rice syrup with honey, and added shredded coconut. I had a taste test before putting it in the oven and it is delicious!! Thanks! I love this recipe! Just made some with Nutella instead of peanut butter, then also added some hazelnuts and dried cherries. So tasty. Thanks for sharing! I made these today but they were crumbly. I wondered whether they were “wet” enough when I pressed them into the pan but I thought they were okay. I’ll crumble this batch and use it as granola. Next time I’ll be sure they’re “wetter”. Does it need to be natural peanut butter ??? If you are having a hard time making them hold together, I usually add a couple cups of marshmallows (I know it makes it less healthy but it does help them to be chewier and my kids like them more) and only cook it until they start to look a little golden (only about 10-12 min). You can also add rice krispy cereal to make some more texture difference. Steel cut oats work way better than quick oats or even standard quaker. You can even prewet the oats (just a little- don’t soak) to help them soften and make more of a chewy bar that holds together. I had the same crumbly problem. The crumbs however, taste really yummy. I also used natural PB which I couldn’t get to melt very well at all…We don’t use a microwave, so I was wondering if that might be why. Added more honey to try to get it more “doughy”, but I guess it wasn’t enough. I’m thinking it would probably work best with a microwave, or at least a sugarier brand of PB. Thinking of using as regular old granola, but I need to figure out a way to make it a little firmer. Can I rebake somehow? Any ideas? Thanks! This is a great recipe. I did the no bake version and like the texture better than baked versions I’ve tried in the past. I added in a half cup of cocoa powder to the honey and PB when it was simmering and am ecstatic with the results. I didn’t realize that cocoa has one gram of fiber per TBS. Also, for those having trouble melting the peanut butter try heating the honey with it. This sounds so awesome. But I’m a little bit worried about adding honey to mine, because most of the time I don’t like the taste. What does brown rice syrup taste like and will I be able to find it anywhere? Like Wal-Mart? Not sure if Walmart has it because I don’t shop there, but I am guessing no – only because it can even be tough to find in my local grocery store. But you never know – they might have it so I would check! If you don’t like honey you may not like brown rice syrup… perhaps try agave or maple syrup?? Hi,I’m going to try making these for my very,extremely picky 15 yr old son:P please try the Bacon ones so I can get that recipe too? He is always hungry and growing like a weed! It’s hard to find stuff to send with him to school that he dosent have to heat up or keep cold!! THX. Just made these! They are AWESOME!!! love the simplicity, thanks for the recipe! Well, we made these last night and sadly they were just crumbles. They were very tasty though and we ended up having this over our ice cream for dessert w/ the rice syrup….sooooooo yummy! I like this recipe but my chocolate chips always melt and make the bars brown because of the melted peanut butter. Suggestions? Maybe put the chips in the freezer before you start, then fold them in with only two or three folds immeaditly before packing in the tin. Be quick. They should keep shape in oven when packed in. (I freeze berrys overnight so they dont break up in heavy mixes like scones). You could dot the chips on top instead? I used Adams all-natural creamy peanut butter at room temperature. It is already pretty runny when not refridgerated, so i didn’t need to melt it at all. I also added maple syrup because it needed more liquid, and substituted grape nuts for the peanuts because i never have peanuts on hand. I can’t wait to try another variation with this recipe: espresso molasses with chocolate chips! These look great! And the nutbutter & fruit possibilities are endless, almond and apricot sounds pretty good too. A healthier option for my husband and easy to make with the kiddo. Thanks for the recipe, I got here via Pinterest. Mine are super crumbly. Any suggestions? I halved the recipe because I wanted to make sure I liked them before I wasted all the ingredients, but if anything I added a little more PB and honey than too little. I also added a bit of flax seed and wheat germ. They still taste good but I’ll just have to eat it like trail mix rather than a granola bar! I read some of the previous comments and go some ideas. Next time I’ll try more PB and honey and see how that works out. I made these yesterday and they turned out great. In addition to the oats and peanuts I threw in a few tbs of flax seeds, a handful of raisins and a handful of coconut. I also used honey. Mine did not crumble. I probably used closer to 1c of peanut butter, and I pressed really hard using wax paper. I also pressed chocolate chips onto the top :) They kept their shape pretty well during baking. When I make again, I think I’ll increase the peanuts and/or add more nuts. I left mine crumbly and added it to my trail mix! Until they decide exactly what is going on with the arsenic levels found in brown rice syrup, I would use an alternative with no known arsenic levels such as honey or agave. Also, posting calories, fiber, et al with these recipes would be helpful. The chef where I work, made bacon ice cream…….. I bet you could omit the extra 1/2 cup of peanuts and just use chunky peanut butter – maybe a full cup instead of 3/4. I’m going to try it! They would also be a hit with almond butter or a nutella/nut butter combo! We added in craisins & semi sweet choc chips. My husband’s coworkers are all asking me to make again!! These sound great – I’m looking forward to nap time so I can make them. Has anyone tried maple syrup instead of brown rice syrup or honey? Has anyone tried this using powdered peanut butter? I love saving on the calories and fat, wonder if it would work in this recipe. Just made these last night and not sure what I did wrong but they did not stick together. So this morning I whipped up another batch of “sauce”, recrumbled the granola and mixed it all together. Just want you all to know that this did not work either. So will try again afresh, tomorrow. Tasted good tho’. i simplified this recipe. 4 c granola cereal,1/2 c peanuts (chopped),3/4 c peanutbutter,1/2 c honey.melt peanutbutter,add honey,mix. add to granola cereal and chopped peanuts,mix well,chill.super simply and really good. Pingback: Power Peanut Butter Granola Snacks « What will I cook today? Thank you for sharing such a wonderful recipe! 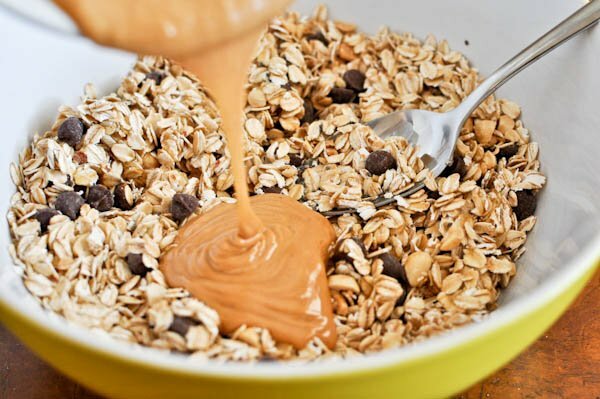 Sounds yummy… what could be substituted in lieu of an oatmeal allergy? Yes, that makes it no longer a “granola” bar, but still interested in making them! If the mixture is not holding together, you have to place a piece of waxed paper on top of it when it’s still warm and really press. Store bought granola bars are packed and dense, so really press these. I have a batch sitting on my counter and they are amazing!!! I made these this morning, found on pinterest, they are delish! To keep them from crumbling I pressed down on them with back of a spoon a couple times while they were baking in the oven.. hope that helps, happy baking! Just made these. WOW. Easy and delish. I saw a few other people posted about them being too dry. I had the same issue. Simple as adding more PB or honey? Any idea how to tell if they are “too dry” before putting them in the oven? Really good as is, but less like bars … more like granola.